As climate change continues to be the greatest environmental threat to our planet, Torys is proud to have participated in Earth Hour once again in 2009. 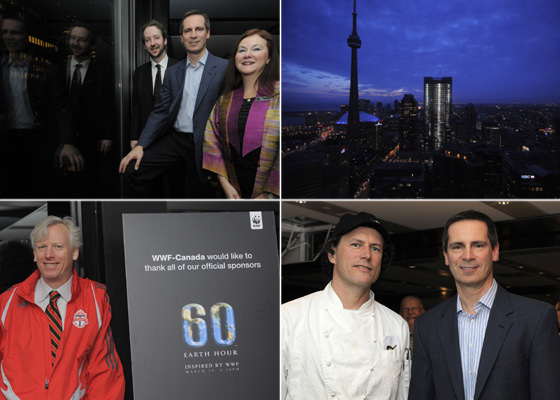 On Saturday, March 28, Patricia Koval (WWF-Canada's chairman of the board and co-founder, and co-chair of Torys’ Climate Change and Emissions Trading Practice) and Gerald Butts (WWF-Canada's president and CEO) hosted a lights-out event to celebrate Earth Hour. More than 200 guests, including Ontario Premier Dalton McGuinty, Toronto Mayor David Miller and other community and business leaders attended the candlelight buffet dinner to participate in this movement from the heart of Toronto in Torys' Client Centre. The guests were served a local, sustainable menu selection created by Toronto chef and food activist Jamie Kennedy. Earth Hour is an annual global WWF event created to demonstrate that each of us, working together, can make a difference in fighting climate change. In 2008, 10 million Canadians and 50 million people around the world participated. This year, Toronto saw energy use drop 15.1% during Earth Hour (up from last year's 8.7%), while Ontario saw a 6% drop. Clockwise from top left: Gerald Butts, Dalton McGuinty and Patricia Koval. The darkening Toronto skyline. Jamie Kennedy and Dalton McGuinty. David Miller. Photos © WWF-Canada/S. Lake.